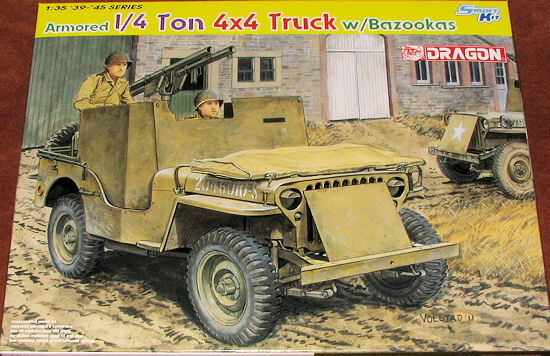 It is not often that we see a Dragon kit in 1/72 and then in 1/35, but so it is with the armored Jeep. Of course, model companies nowadays have become smart enough to get around paying what must be pretty hefty licensing fees by simply not naming what it is and using generic terms. I doubt if many model builders do not know a Jeep when they see one. Well this is a nice one. It is not a curbside and has a full engine as well as a nicely done suspension that fits onto a one-piece frame. The one-piece body sans hood and tailgate then fits atop all this with the usual separate seats in the front and a rather small two place seat in the back. This is a Smart Kit so you can be sure there is photo etch. Not only for small things like headlight guards, but also for the forward armor in the area that used to have the windscreen and the plate over the radiator. This kit differs from the earlier release by having a twin bazooka mount in place of the .50 cals. This fits on a pedestal that fits in front of the passenger seat. This also has a couple of pieces of etched brass. The cockpit armor sheet is a single piece that merely needs to be folded before being glued into place. There is no standard windscreen or frame with this on so you will have to build the armored variant. I mean, why buy the special version and not use the special bits? However, there is a piece that is the windscreen folded down and covered with a tarp. 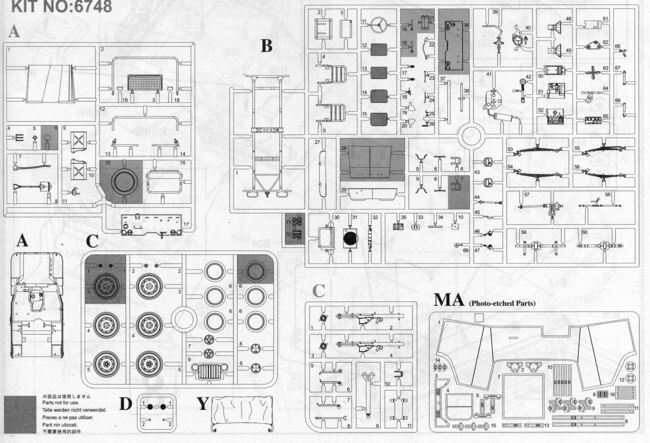 Standard Dragon instructions with Gunze and Model Master paint references. Decals are for a single specific version shown on the box art that was with the 60th Infantry Regiment, 9th Division during the Ardennes campaign of 1945. The sheet also has enough additional letters to do just about any one you wish. Decals are also used for the dash instruments and placards. In all, a very nicely done kit of an interesting version of the ubiquitous "1/4 ton 4x4", and one that has been getting quite a bit of kitting done as of late. For sure it will make into a great model when done. Thanks to www.dragonmodelsusa.com for the preview kit. Get yours today at your local shop or retailer.